Nickel Diner is just about three years old now. In that time, it has gone from gritty Downtown L.A. pioneer to hip Downtown L.A. legend, all while managing to stay true to its sense of both aesthetic and culinary style. Unlike the Main Street USA located in a certain Orange County theme park, this Main Street eatery is not staffed by “cast members” who smile cheerily as you walk through the door, nor is does it open onto a sidewalk cleared of stragglers and steam-cleaned every night. And yet, people come from all over the Southland to revel in (or brave) the still funky neighborhood to eat Monica May’s yummy take on classic diner cuisine — and to eat donuts that are hand covered in genuine maple glaze and dipped into bits of freshly cooked bacon (fast forward to about 4:06 of the video below to watch them being made). This past week, it was my turn to bring Thursday breakfast for all the co-workers at The Day Job. Most people bring some muffins or bagels, the more health conscious bring fruit, and a box or two of Krispy Kremes has been known to appear (and quickly disappear) on occasion. I had mentioned Nickel Diner’s treats in the past and people laughed it off as a myth, so I knew that I’d be bringing The Donuts when my week came around. 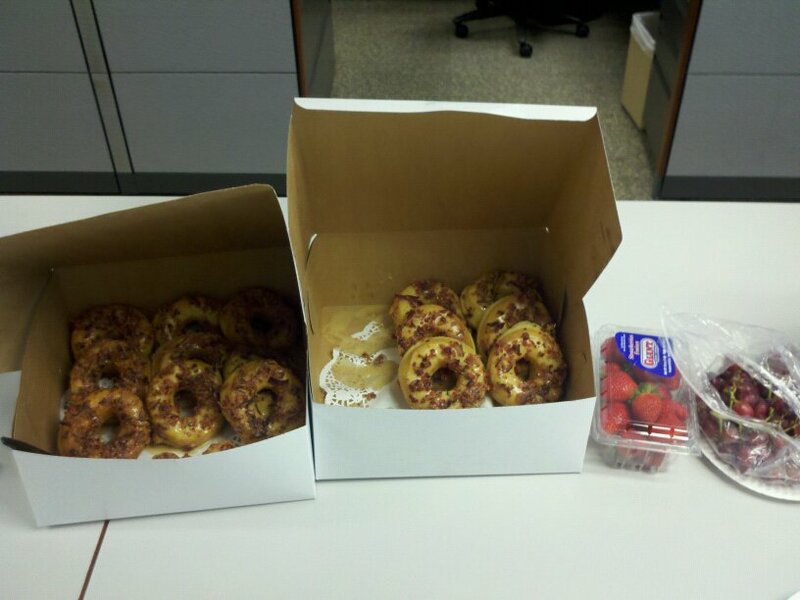 Maple Bacon Donuts, mere minutes after being placed on the office credenza. Note that the fruit is virtually untouched. I called up a couple of days before hand to place my order. When Thursday arrived, I woke up the Mrs. and Jr. early and dragged them with me so I could use the carpool lane into Downtown. When we arrived, I waited for the doors to open, standing alongside a touristy-looking couple, an unkempt and babbling Main Street local, and two leggy twentysomethings who were too obliviously involved in their conversation to realize they were cutting in line in front of everyone else. I eventually picked up the two boxes of treasure and walked back to the car where Mrs. CKDH promptly removed and reserved half a dozen for the family. We proceeded to the office where the remaining 18 breakfast treats — along with some grapes and strawberries for the more close-minded — were plopped onto the credenza to the awe of the co-workers. Everyone, including the skeptics, had some. Some may have started by cautiously cutting off a thumb-sized piece just to be polite, but they soon came back to carve up ever-larger chunks. The calorie counters in the group cursed me as they tried to overcome their urge for a second serving. By lunchtime, only one was left. After lunch, the lone survivor kept getting cut into smaller and smaller portions until I finally implored someone to just put it out of its misery and eat the last of it. In stark contrast, the fruit sat alongside the empty boxes half-eaten until one young lady decided to take it home at the end of the day. Another day of conquest for the hero of Nickel Diner. Tags: Downtown LA, Downtown Los Angeles, Koa Duncan, maple bacon donuts, Monica May, Nickel Diner. Bookmark the permalink.